Just about everyone loves puppies and many people choose to get a puppy instead of an older dog. However, raising a puppy isn’t always easy. When you bring a puppy into your home, most puppies have basically zero manners or social skills. They’re simply too young to have learned much yet. For instance, many puppies nip when you pet them or play with them. They don’t know any better. It’s up to you to train your puppy and stop puppy biting. Your puppy has spent the first few weeks of his life playing with his littermates and his mom. He’s been wrestling and tugging, chasing and fighting with puppies his own size. In this situation it’s perfectly normal for your puppy to nip and bite. The other puppies simply bite him back. If he bites or plays too hard, the other puppies won’t play with him. They’ll walk away and ignore him. Or, if he gets really out of line, his mother may nip him. Bite inhibition is when your puppy learns to moderate his biting. He doesn’t take a chunk out of his brother. He learns the difference between biting hard and a play bite. It’s important that your puppy understands this idea because you will use it when you teach him to stop nipping. However, your puppy won’t stop puppy biting as long as he lives with his mom and littermates. Why Does Your Puppy Bite You? When you bring your puppy home with you, you can see that your puppy will probably apply this same behavior to you. This kind of play-biting is what he’s been doing with his brothers and sisters. So, when you play with him he likely thinks it’s okay to nip and bite you, too. It’s up to you to stop puppy biting and teach him to play without nipping. You will need to emphasize the bite inhibition idea. The best way to stop puppy biting is by mimicking the behavior of a littermate. That may seem strange, but it works. When you are petting or playing with your puppy and he nips you or gets “mouthy” with you, you should YELP! to let your puppy know that it hurts. Then withdraw for a moment. This will probably startle your puppy. This is the same sort of thing that one of his littermates would do if your puppy bit them too hard. Even if your puppy barely touches you with his teeth you should YELP to let him know that it hurt, or could have hurt. Your puppy will probably resume what he was doing so be prepared to YELP again. If your puppy continues, you should walk away for a couple of minutes and stop playing. When your puppy has calmed down after a couple of minutes you can resume playing. See if he tries to nip you again. He may. If he does, you will need to YELP again and stop playing for a longer time. Leave the room and stop playing with him. Ignore him. Again, you are doing what a littermate would do. When a puppy plays too roughly, the other puppies ignore him temporarily until he can play without hurting them. 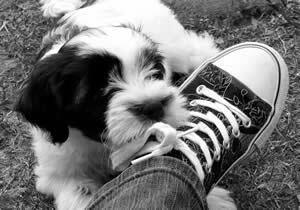 If you continue this way for a few days your puppy will learn that when he uses his teeth during play or petting he will be ignored. This should stop puppy biting. You should also praise and reward your puppy for gentle play and for allowing you to pet him calmly. This can be hard to do with a puppy since many puppies become very excited and rambunctious as soon as you bring out a treat. Consequently, you should go easy on the treats and give lots of gentle petting. Use lots of soothing praise to let your puppy know he’s being a good boy when he lets you pet him calmly without any nipping. Some breeds do tend to be “mouthier” than others. Many of the sporting breeds are very mouthy and like to put their mouths around your hand, even if there is no biting. It’s a bird dog thing since, by instinct, they pick things up in their mouths and carry them. You may still want to discourage your dog to stop this behavior. Some other breeds can continue nipping for longer periods of time if you don’t make them stop, especially some Toy breeds. It’s very important to stop puppy biting since it can turn into adult nipping which can be one of the more dangerous dog behavior problems. If you are persistent, you can stop puppy biting by following the suggestions here.